This is the perfect glossy winter garden magazine - there are lots of beautiful spring English gardens to stare at and enjoy. The colours are heart-warming, and give me hope - perhaps spring isn't actually that far away! I've bought this magazine a few times, and have a strict rule - I am only allowed to read about one garden per day. This way I can concentrate and look deeply at the plants and designs, rather than skimming over everything too quickly. 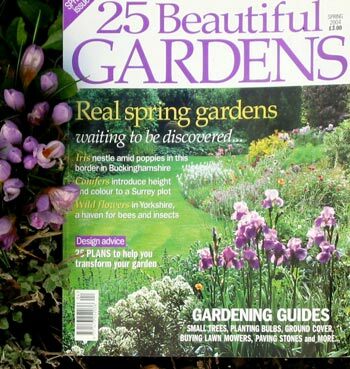 By the way, the small crocuses on the left of the magazine photograph are one of my most colourful winter plants. Roll on spring!